Earplugs like these work well with other forms of protection, but do not keep out as much sound as earmuffs. Construction sites are naturally noisy places, and all that noise can have adverse effects on your hearing. While this isn’t a surprise to anyone, exposure to loud noises can impact your ability to hear over time. It’s important to protect yourself while on the job because a loss of hearing can do more than just make it hard to hear. Following are a few ways hearing loss can affect you, and how to protect yourself at the workplace. Loud noises can be distracting and make communication on the job difficult, and if it leads to hearing loss you could have problems doing your job for the rest of your career. In the same way, hearing loss can make it hard to interact with people in social settings. Difficulties communicating with other people can lead to emotional distress, but hearing loss may affect your physical health, too. Studies have been done on the relationship between excess noise exposure in the workplace and coronary heart disease. The study found that participants regularly exposed to occupational noise tended to have higher blood pressure, but other circumstances, being overweight or a smoker for instance, were more likely to contribute to heart disease in participants. The most common type of hearing protection devices are earplugs. These range from one-time use foam earplugs to professionally custom molded earplugs. 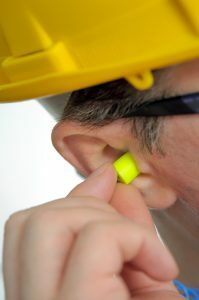 The biggest advantage of earplugs is how unobtrusive they are, and how easily they fit with other protective wear like safety goggles and hardhats. However, they do not offer as much protection from hearing loss as earmuffs, which completely cover the ear and let in less sound. Earmuffs are bulky and hard to wear with other protection, though. This entry was posted on Wednesday, June 22nd, 2016	at 12:00 pm	. Both comments and pings are currently closed.